Adirondack region new media / social media writers and producers are invited to gather at the Adirondack Museum on Friday, May 7, 2010 from 5 until 7 pm for a networking event and backstage tour of the Adirondack Museum’s exhibit “Let’s Eat: Adirondack Food Traditions”. Local bloggers, Twitter users, social media writers and producers and new media journalists, will be getting together in the Adirondack Museum’s “Living With Wilderness Gallery” for food, drink, and networking, before taking an early behind the scenes look at the Museum’s featured 2010 exhibit. The month of March marked the fifth year anniversary of Adirondack Almanack. In the past five years the site has grown to include over a dozen regular contributors. We’ve hosted hundreds of discussions (a few of them heated, others enlightening, some even funny), but through it all I think it’s safe to say the Almanack has offered its readers a unique look at life in the Adirondack region from inside the Blue Line. 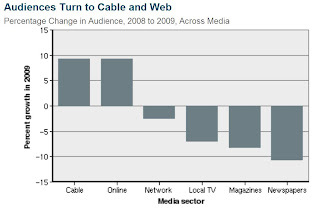 I thought that on this occasion I’d take a look back at how regional online media has changed in the last five years. You might recall a similar look at the local blogosphere that I did in 2006, and again in 2008. Looking back on the events since Adirondack Almanack was launched in 2005, I think the last few years might be considered the beginning of a new micro-era in local media, one that follows the movement of local media online between 1997 and 2003. First a little history, setting aside the earlier digital communities like Usenet, GEnie, BiX, CompuServe, e-mail listservers, and Bulletin Board Systems (BBS), widespread availability of news and commentary online is now a 15-year-old phenomenon. You can see some great historical moments at the detailed Timeline of New Media History at the Poynter Institute, and a look at early newspaper online failings at Gawker’s Valleywag blog by Nicholas Carlson. Although Poynter’s timeline cites a Columbus Dispatch deal with CompuServe in 1980 as the first online newspaper, suffice it to say that newspapers and other media outlets began going online in large numbers beginning in the mid to late 1990s. According to Chip Brown in the American Journalism Review, there were just 20 newspapers online worldwide in 1994, and some 5,000 by 2000 (almost 3,000 in the US). That trend holds true in the Adirondack region as well. According to the Internet Archive (which is probably close to accurate), the Glens Falls Post Star was first out of the box locally when they launched their online site in 1997. North Country Public Radio went online the following year (1998), just in time for the arrival of Brian Mann, who moved to the area to help start the station’s news bureau. The Plattsburgh Press Republican didn’t arrive online until 1999. Apparently the laggard of the local daily news bunch was the Adirondack Daily Enterprise. Archived pages of that paper only stretch back to 2003, although it’s possible they had a simple site up before that. [Do let me know if any of these dates are wrong]. Right behind the newspapers were an early corps of online citizen journalists, diarists, and commentators. According to a short history of blogging written by Rebecca Blood, at the beginning of 1999 there were just over 20 known “weblogs” (remember that word?). By the end of 2000, there were thousands of newly dubbed “bloggers” keeping various permutations of online diaries, lists of links, and commentary. The rise of blogging platforms like Blogger (1999, Pyra Labs; sold to Google in 2003, the same year TypePad was released), and WordPress (released in 2005), helped popularize the idea that anyone with basic internet and computer skills could publish their own content easily. In today’s new media environment everyone can be a producer of online content (print, audio, and video). By the time Adirondack Almanack was launched in 2005 there were about 10 million active bloggers (in others words, those still publishing three months after launching their blogs). There was just two local blogs then, Dale Hobson’s Brain Clouds, begun in 2002, and Mark Hobson’s (no relation) Landscapist, begun in 2003. Adirondack Musing began on the same day as the Almanack in March of 2005. Although some purists might differ as to whether or not it qualifies as a blog, Mark Wilson began regular postings of editorial cartoons at EmpireWire.com in 2001. Today, local media have legions of mostly unread bloggers with NCPR’s The In Box blog, begun last year, being the notable exception. Blogs have grown in popularity in the last few years in particular with studies showing that about twenty-five percent of Americans now turn to blogs at least weekly. We’re promised instant catalog shopping—just point and click for great deals. We’ll order airline tickets over the network, make restaurant reservations and negotiate sales contracts. Stores will become obsolete. So how come my local mall does more business in an afternoon than the entire Internet handles in a month? Even if there were a trustworthy way to send money over the Internet—which there isn’t—the network is missing a most essential ingredient of capitalism: salespeople. Wonder what Stoll is up to these days? Turns out not much. His 1995 book Silicon Snake Oil is now available for 75 cents plus shipping from Amazon.com. Here’s a prediction of my own; something I’ve been thinking about lately. Network news and cable TV in general will be dead before newspapers. The reason? The high cost of cable TV service compared to the readily available access to online video from sites like Hulu, YouTube, and Netflix. An increasing number of people are looking for TV programming “outside the box” and that trend is expected to grow dramatically in the coming year. Another prediction: desktop computers will shift from their current look to the iPad model. Horizontal touch screens will shift our gaze from the monitor to the actual desktop, so sell your traditional computer monitor maker stock now. This shift will also hasten the end of newsprint as consumers shift to these more portable (and more ergonomic) readers. Nine out of ten Americans now access the internet. Fifteen years from now, the way we encounter media will have been dramatically transformed. This summer the Adirondack Museum will be offering a special exhibition focused on Adirondack food traditions and stories. I’m happy to report that beginning next week, Almanack readers will be getting a regular taste of the exhibit “Let’s Eat! Adirondack Food Traditions” served up by Laura Rice, the Adirondack Museum’s Chief Curator. The region has rich food traditions that include fish, game, cheese, apples and maple syrup; old family recipes served at home and camp, at community potlucks and around campfires. Laura Rice will be preparing stories drawn from the exhibit that focus on the region’s history of cooking, brewing, eating and drinking. Look for her entries to begin March 16 and continue every other week into October. The exhibit, a year in the making, will include a “food trail” around the museum’s campus that will highlight food-related artifacts in other exhibits. The number of artifacts in the exhibit itself is between 200 and 300 including everything from a vegetable chopper and butter churn to a high-style evening gown. There’s a gasoline-fueled camp stove the manufacturer promised “can’t possibly explode”; a poster advertising the Glen Road Inn (“one of the toughest bars-dance halls in Warren County”); an accounting of food expenses from a Great Camp in 1941 that included 2,800 California oranges, 52 pints of clam juice, and 90 pounds of coffee; and an Adirondack-inspired dessert plate designed for a U.S.
Chief Curator Rice along with Laura Cotton, Associate Curator, conducted most of the research and writing for the “Lets Eat!” exhibition. Assistant Curator Angie Snye and Conservator Doreen Alessi helped prepare the object and installation. Micaela Hall, Christine Campeau and Jessica Rubin from the museum’s education department weighed in designed the interactive components. An advisory team was also formed made up of area chefs, educators, and community members and two scholars, Marge Bruchac (University of Connecticut), and Jessamyn Neuhaus (SUNY Plattsburgh) also weighed in. “Let’s Eat!” is sponsored by the New York Council for the Humanities and Adirondack Almanack is happy to have the opportunity to share stories from the exhibit with our readers. Shaw teaches writing at Middlebury College, where he also co-administers the Middlebury Fellowships in Environmental Journalism. He and his wife Sue Kavanagh salve the wounds of exile by spending as many weeks a year as they can at their one-room cabin on a remote northern lake. Chris will be offering monthly installments of what he calls “a series of snapshots from my fifty or more years of Adirondack experience.” This first, which takes us back to Bushnell Falls in 1969, will appear this Saturday. 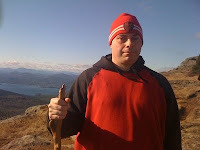 Please join me in welcoming Brian Farenell to Adirondack Almanack. Regular readers may recognize Brian as the insightful commentator at Musings of a (Fairly) Young Contrarian, where he regularly offers insights and ideas about national and local issues. His commentary on local media has been a breath of fresh air in the sometimes polluted mass media environment and we hope his regular monthly contributions here will help clear the Adirondack air as well. A nearly-lifelong resident of Glens Falls, Brian has been involved in writing and journalism since his high school days. After receiving a bachelor’s degree from Clarkson University, he spent two years in the Peace Corps in the Republic of Guinea, West Africa. Although his traditional focuses have been international affairs (he’s been published in Foreign Policy magazine) and media criticism, he has more recently gained a deepened appreciation for the Adirondack region through a new-found love of hiking. When he is not writing or hiking, Brian can usually be found biking or kicking around a soccer ball. 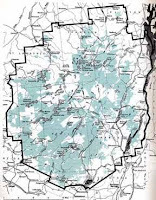 Brian will kick off his contributions to the Almanack today at noon with a piece on the recent controversy over the Glens Falls Post Star‘s coverage of the Adirondack Park Agency. Please join me in welcoming zoologist Larry Master to Adirondack Almanack. Larry, who lives in Lake Placid, has been photographing wildlife and natural history subjects for more than 50 years. After receiving a PhD at the University of Michigan, Larry spent 20 years with The Nature Conservancy and 6 years with NatureServe, most of that time as the organization’s Chief Zoologist. Larry oversaw the development of TNC’s and NatureServe’s central zoological databases, and also served on the EPA’s Science Advisory Board. He currently serves on boards of NatureServe, The Nature Conservancy’s Adirondack Chapter, Northern New York Audubon, the Adirondack Council, and the Adirondack Explorer, as well as on the Wildlife Conservation Society’s Adirondack Advisory Group and in an advisory role to the Biodiversity Research Institute. Larry will be writing about wildlife every other Thursday at noon, opposite our birding expert Brian McAllister. The addition of Larry rounds out the Almanack‘s natural-history coverage, which includes regular field reports by Ellen Rathbone. We’re still looking for ideas about who should be included on a list of the Adirondack region’s most influential people. We’ll be offering a list of the people who have had the greatest impact on the Adirondacks on January 18th. Head over to the original post to leave your suggestions in the comments. Suggestions should reflect the environmental, cultural, and political history of the park, and they need not be residents of the region, provided their impact was significantly felt here. 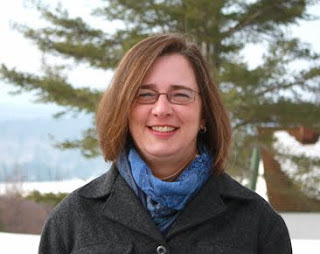 Please join me in welcoming Christie Sausa of Lake Placid as the Almanack‘s newest contributor, heading up our winter sports coverage. 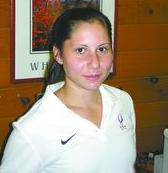 Christie is a member of the historic figure and speed skating culture in the Olympic Village, and writes about those sports for the Lake Placid News and on her own blogs, including the popular Lake Placid Skater which she founded in 2007. Sausa, who attends North Country Community College (she’s pursuing a sports and events management degree), will be taking her budding journalism skills behind the scenes at local competitions, and will also be writing about our local athletes, including the many World Cup and Olympic hopefuls. Her reporting for the Almanack will include the more popular sports (like ski-jumping, downhill, snowboarding, and cross country) the sliding sports (luge, skeleton, and bobsledding), as well as the more obscure local sports like biathlon, skijoring, and dogsledding. When Sausa is not on the ice herself, or writing about what happens there, or learning about managing what happens there, she is helping her mom with their local business, the Lake Placid Skate Shop. Sausa was recently invited to join the Phi Theta Kappa Honor Society, and is also a member of the Kiwanis Club of Lake Placid, the Connecting Youth and Communities Coalition, the Skating Club of Lake Placid, and the Lake Placid Speed Skating Club. More than 1,200 people get Adirondack Almanack each day via RSS and e-mail subscription services. It’s a convenient way to get the latest news and information about the Adirondacks. Please join me in welcoming Phil Brown of Saranac Lake as a new contributor to Adirondack Almanack. Phil has been the editor of the nonprofit Adirondack Explorer, the regional bimonthly with a focus on outdoor recreation and environmental issues, since 1999. He is also an energetic outdoorsman whose job and personal interests often find him hiking, canoeing, rock climbing, trail running, and backcountry skiing, all experiences that will no doubt inform his his weekly posts here at the Almanack. Phil’s work will appear mostly on Monday afternoons, but occasionally at other times as well. Brown is also the owner of Lost Pond Press, which has published Bob Marshall in the Adirondacks, an anthology of Marshall’s writings, Adirondack Birding by Gary N. Lee and John M.C. Peterson, and Within a Forest Dark, a prize-winning novel by Michael Virtanen. Regular readers of Adirondack Almanack know that the site has been growing dramatically over the past year with the addition of a dozen new contributors. In contributing to the Almanack, Phil Brown will be joining quite a stable of outstanding local writers: longtime local journalists Mary Thill and Lake George Mirror publisher Anthony Hall, experienced local naturalists Ellen Rathbone and Brian McAllister, paddling guru Don Morris, local inquiring family writer Diane Chase, outdoors writers Alan Wechsler and Kevin MacKenzie, local music contributors Shamim Allen and Nate Pelton, and local politics sketch commentator Mark Wilson. Our complete list of contributors is located at the lower right side of the page. Are You Getting The Almanack Every Day? More than 1,200 people get Adirondack Almanack delivered to their In-box each day. You can subscribe through E-Mail or RSS, or follow us on Twitter or Facebook. It’s a convenient way to get real-time news and information about the Adirondacks. Our regular Adirondack Music Scene contributor Shamim Allen is over in Europe for the next six weeks, so North Creek’s Nate Pelton has graciously accepted the role of guest contributor while Shamim’s gone. 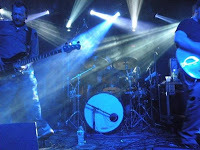 I’ve been trying to get Nate to contribute for some time – he knows the music scene in the southern and eastern Adirondacks well, and would be an outstanding addition to our music coverage here at the Almanack, which tends to focus on the northern and western parts of the region. It’s my hope, this short foray into the world of the Almanack will become a permanent feature, but we’ll have to wait and see. Like most of us around these parts, Nate has a lot of irons in the fire. 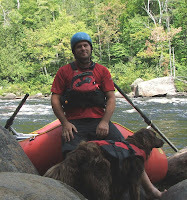 After more than ten years as a raft guide and manager at Hudson River Rafting Company, Nate and his wife established the North Creek Rafting Company in 2006. During the “other” North Creek season, Nate is a trail groomer at Gore Mountain and runs the North Creek Tuning Shop. Nate also does web design and development as Grateful Design, and is the man behind ADK Music Event Production. Nate has been handling the arrangements for North Creek’s Music by the River concert series. Nate has dabbled in a variety of music styles. He says the first concert he can remember attending was Michael Jackson’s 1988 Bad tour with parents and sister. Nate has since seen such legendary bands as The Who, The Rolling Stones, Supertramp, Stevie Wonder, and Elton John. He’s seen about 40 Grateful Dead shows in the early 1990s, and also wouldn’t miss a chance to see South Catherine Street Jug Band, Donna the Buffalo, or Giant Panda Guerilla Dub Squad. Please join me in welcoming Nate. I’m pleased to announce the addition of Alan Wechsler to the Adirondack Almanack. Alan will be covering the outdoor recreation beat and his regular posts will run on Wednesdays at noon. Alan has been coming to the Adirondacks since his uncle took him on his first backpacking trip—with wet snow, followed by temperatures down to zero degrees—at age 15. He says he still hasn’t learned his lesson. Today, his frequent adventures into the park include mountain-biking, skiing (cross-country and downhill), hiking, canoeing, kayaking, and climbing (both rock and ice). A long-time newspaper reporter and avid outdoor photographer, he also writes for a number of regional and national magazines about the outdoors and other issues. Alan’s recent piece for Adirondack Life, Ski to Die, is an International Regional Magazine Association first-place feature-writing winner. Got an Adirondack outdoor recreation story idea? Contact him at alwechs at juno dot com. So this my last post for approximately a month. I will miss the North Country and all of the wonderful events I’m sure to hear about when I return in December. I’m headed to Portugal and Normandy. It’s sure to be an exciting trip and I already have a planned meeting with a cool musician, Aurel, in Burgundy. Who knows what other musical adventures I shall have in between. (Note to self: find a guitar once there, ASAP). If I were in town I’d be dancing to CIDERHOUSE on Halloween probably dressed as a question. In Potsdam Roots of Creation are playing at St. Lawrence University. These guys play a combo of mostly reggae and jazz and then there is this tune that must be fairly new called “Bulls On Parade”. It has some blistering guitar riffs and hip hop mixed in. The show starts at 8 pm. If you don’t catch them this time around they’ll be at the Waterhole on December 5th. In Saranac Lake every Thursday, Community Ceili starts at 7 pm. Just want to remind everyone that this very friendly weekly Celtic music-making experience is open to anyone who wants to play or listen. I learned a lot of tunes this way and I improved my group rhythm playing. It’s held at the North Elba Town House, which is next to Maddens and Guide Boat Realty. In South Colton a Halloween Dance, live band included, will be held at the Raquette Valley Fish and Game Club. The band is called The Generation Gap. The dance starts at 8 pm and ends at 11:45 pm. Admission is $3. In Lake Placid at LPCA – The Rocky Horror Picture Show! It starts at 11:45 pm, a great kick-off to the holiday weekend. So many great people from the area are going to be singing and dancing in conjunction with the showing of the classic film. I’m bringing a teenage friend for her first time. In Queensbury a Coffee House Open Mic is happening at the UU Church. This event is held every last Saturday of the month from 7:30 – 10 pm. The church is located at 21 Weeks Road. Fruit, beverages and dessert are included with a $4 donation. If you live in the southern end of the park go on out and support these folks. In Saranac Lake, CIDERHOUSE, which features band members from the Nitecrawlers, Electric Blue and Kozmik Truth. Callie K is their excellent lead singer and I see on their website that she plays “extreme washboard”—now that is something I wish I were in town to see. Always a fantastic Halloween party with tons of dancing and costumes. Often special guest musicians show up and the results are exiting. Music is supposed to start at 9 pm. In Tupper Lake Abbott Hayes will be performing at Old Northern Pub. The show starts at 10 pm and there is a $5 cover. They have a tight pop rock sound with good lyrics. I’d go see them if I were around. In Potsdam; an Organ Recital by Rebecca Muir MacKellar will be held at 4 pm. It will be held at the Trinity Episcopal Church. Adirondack Almanack is pleased to announce that Don Morris is joining the site as paddling contributor. Don’s posts on all things canoeing and kayaking will run monthly, beginning tomorrow. Don is co-author of Adirondack Canoe Waters, North Flow, the classic canoeing and kayaking guide and just a great book, period. “Don is an experienced kayaker at home in technical waters beyond the skill of the original writer,” Paul Jamieson (the book’s selfsame original writer) wrote in 1994 as he announced the transition in authorship. Jamieson died in 2006 at age 103. Don has added whitewater routes as well as detail about technical runs to the book. But he says he spends just as much time on flatwater in the Adirondacks and on his travels outside the region.